Create connectivity applications to access serial devices with your iPhone 3GS/4, iPod touch 4G or iPad device. 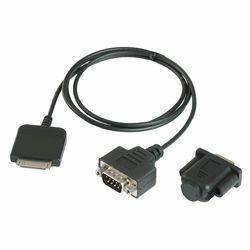 When used with apps created with the free-to-download software development kit, the Redpark serial cable gives your iOS device the power to communicate with RS-232 serial devices. The C2-DB9V version uses the USB pins to communicate with an iOS device via the 30-pin connector. This version is incompatible with certain third party accessories such as DockStubz. Requires iPhone, iPod touch or iPad with iOS 5.1+. Devices with Lightning connector (iPhone 5, iPad mini) require adapter. Please note: serial communication apps not currently available. Redpark's software development kit (available for free download from redpark.com) allows programmers to create compatible apps.